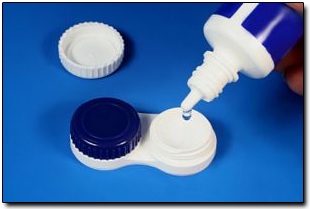 When you are fitted for contact lenses a particular lens care system is recommended ~ a group of products to clean, disinfect and make your lenses safe and comfortable for wear. Disinfecting to kill growing forms of microorganisms (bacteria, fungi, and viruses) of the lenses. Rinsing and storing requires the use of an opthamalmic isotonic saline solution or may be performed with some types of disinfectant solution. 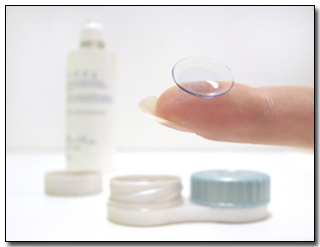 Most saline solutions are not suitable for storage of lenses, as they do not contain anything to kill or prevent the growth of microorganisms. Protein removal removes stubborn protein deposits and, with daily cleaning and disinfection, helps restore a clean, fresh contact lens surface. Protein removal is generally not required for planned replacement lenses which are replaced before the deposits can cause difficulties. Rigid gas permeable (RGP) contact lens care systems RGP lenses must be cleaned and disinfected for safe and comfortable wear. It is important to use only those systems designed specifically for rigid permeable lenses. They are formulated with disinfectants and preservatives proven to work best with the material of which your lenses are made.